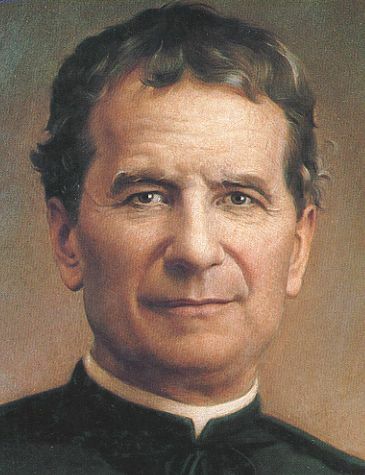 Every year the week before St. John Bosco’s feast I read a book about his life to the kids. The book we’ve enjoyed for several years now is Saint for the Young; The Story of St. John Bosco by Sr. Elizabeth Schmidt, FMA, published by Don Bosco Publications. At 34 pages it is just the right length to give more than an overview and share some of the great stories of the saints early life, priesthood and founding of the Salesian order. Saint John Bosco is one of many saints that helped others become saints. St. Dominic Savio was one of “Don Bosco’s boys.” He came to the oratory that Don Bosco founded and learned a trade along with his faith. He died at age 15 and was canonized shortly thereafter. Both St. John Bosco and St. Dominic Savio are patrons of youth. Today let us ask their intercession for all children especially orphans. 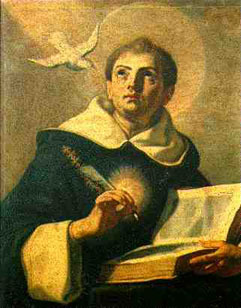 St. Thomas Aquinas was perhaps the most gifted theologian and doctor of the church to date. He is patron for university students. He was lived from 1225-1274 and was a contemporary of St. Francis of Assisi. Read his life story today and pray for his sons The Order of Preachers better known as the Dominicans. I think that all of us can use this prayer whether we are currently "students" or not. We all are students of the bible and of our faith. So as we strive to learn and grow more, let us commit to praying this prayer. Copy this prayer and place it as a bookmark in your bible or catechism. I became a daily communicant the fall of 1997 when our oldest son started Kindergarten at St. Raphael School. Since the children had to be there at 7:55 am, I started attending the 8 am Mass. 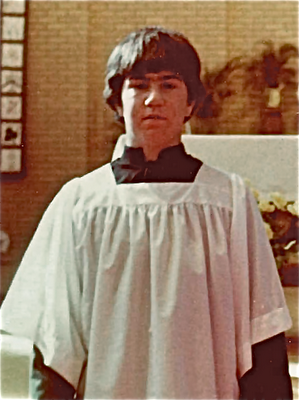 Ginny Hansen was the faithful sacristan. She trained my older boys to serve daily Mass. She trained many children to serve Mass. She had been in the military and brought discipline and order to our church. She was a constant, reliable presence. So were many others, like Claire Schatz who lead the rosary after each mass. I remember thinking to myself, “boy, that will get you straight to heaven.” Claire's daughter Jane Winstead has taken "Claire's pew" and now often leads the same beautiful prayers. Rose Grado sat behind Claire and started the tradition of saying the Divine Mercy Chaplet after the Rosary. Fr. Ken Malley gave her permission to do so. An 80+ year old lady named Mary Marcinko, sat in the front left side. She had to sit close because she used a walker and couldn’t get around very easily. Just behind her were Ruth and Don Mattick, always fixing something, tidying something, making the church nicer. Marcella and George Rankin, Kay Yennie, Ursula Abner, Fanny Abad, Winnie Young and Chris Pelletier were somewhere in the middle. Deacon Joe Grote often came in before going to his job at St. John Vianney Catholic Church. Mr. & Mrs Jerry Walsh sat in the last pew on the right, near Matt Matsumoto. James and Suzanne Flatley sat on the left back side. Mr. Flatley and Mr. Walsh were unofficial door holders when we all left mass. They would always shoot the breeze with Bob Morley and his wife Irene. Helen Bishop sat front and left. She sometimes brought her elderly husband, Ken. Beatriz Crespo and Truus Stuimer usually sat on the right. Truus was sometimes accompanied by her local daughter Marja Beaufait and her out of town daughter Joanne Stuimer, (Marja’s twin.) Truus always had a smile. Ed and Terri Hamm sat middle to front right. They had an easy “commute,”--they just walked across the street from their condo. This made it possible for Ed to oversee and help out with all of the building of the new church. With all my babies, I was perpetually in the cry room. I was often joined by Bonnie Condon, Lisa Richard, Donna Condon, Annina Plummer and Marybeth Finster. We always joked about how many sons we had between us (Musselman 4, Condon 4, Condon 2, Richard 5, Plummer 4+). We prayed that some of them would become priests. At first I was there with just a new born and a toddler and then with 3 more babies as the years passed. Mrs. Flatley knitted baby bonnets for my children. Dolores Smith and Maggie Moren and Bernadette Bailey were the first to see each of the infants, at 8 am mass. Charlotte Overby and Lynn Douglas always had a kind word. Over the years I have had to shift to 6:45 am Mass in order to get all the kids out to school on time. We too had our own nice circle of a dozen or so; Della Uber, Joan Priest, Joan Malone, Winnie Young, Chris Youmans, Matt Matsumoto, Michael Fay, Scott Matirne, John Forney, Terri Hamm, Helene Payne, Kathy Guckenberger and Rosemary Early. But it was smaller and quieter and certainly darker. We all dashed out quicker to get on with our day. Msgr Caverly has been the constant presence, presider and priest through these many years. A great shepherd to us all. Now many of these wonderful friends are with the Lord. I was sad to hear that Truus Stuimer passed away January 20th, but not really. She is welcomed by so many good friends from St. Raphael and the 8 am Mass. We are indeed surrounded by so great a cloud of witnesses. Let those of us here on earth, persevere in running the race set before us with our eyes fixed on Jesus. May these and all of the souls of the faithful departed through the mercy of God, Rest in Peace. Amen. Our faith is certainly a gift. We did nothing to earn it. We can accept it or leave it. But each of us through our baptism has the Holy Spirit within us. That fire, though weak or dormant, can be stirred into flame, just as St. Paul tells Timothy in his second letter, above. On a cold day like today, light a fire in your fireplace and watch how the small flame turns into a blaze. What makes that happen? The match, the original flame, must touch the kindling and the logs. When the kindling and logs are stacked together, the fire can really roar. So too in our spiritual life. We need the original light from God, but then we need to use it and share it. Works of Mercy, bible study, fellowship with our brothers and sisters in Christ, prayer, and especially reception of the Sacraments all serve as our "kindling" and "logs" of the spiritual life. So today, say your prayers, help someone in need, open your bible, get to confession or mass and stir into flame your faith. Jesus told us in Luke 12:49, “I have come to set the world on fire, and I wish it were already burning!" Let's get this fire started! This beautiful picture of St. Paul by Caravaggio shows the light of Christ descending upon Paul in what would be the turning point of his life. 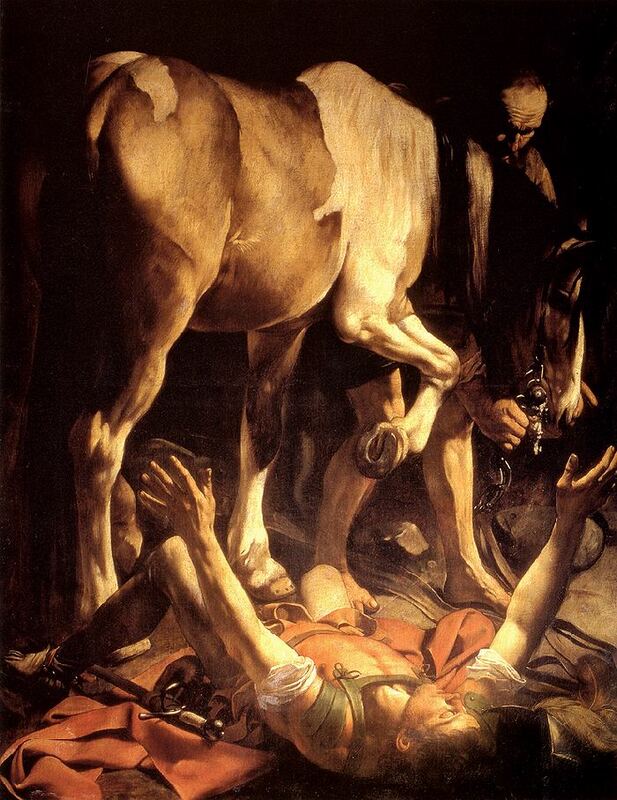 St. Paul had perhaps one of the greatest turnarounds or conversions in history. Today let us ask ourselves: How is my life going? What areas do I need to turn around 180 degrees? Who are those precious friends and family members or whose conversion to the faith I want to pray? Read the story of St. Paul’s conversion in Acts of the Apostles, chapters 9 and 22, alone or with your family. Talk about how God is calling all of us to conversion every day. The bishops have also set aside this day to pray and do penance for all violations of the dignity of the human person. 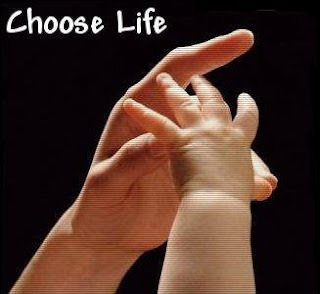 So today let’s fast and pray for all the unborn, for the mothers and fathers that are in difficult circumstances and for conversion of heart for all people who call advocate for abortion. Today make time to pray the rosary outside your local abortion clinic. The St. Petersburg Times had a great write up today on Fr. 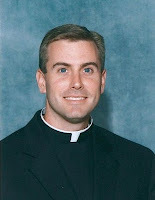 David Toups, pastor of Christ the King Catholic Church in Tampa, FL. The article written by John Barry talked about the enormous responsibility Fr. Toups and all parish priests have packed into a 24/7 work week. The article expressed that Fr. Toups is a man committed to prayer, mass, and liturgy of the hours.Through this "going deeper" Toups is able to meet the needs of his large parish of approximately 4,000 families. Fr. Toups is not afraid to be a Father to his parish. Back in November he published his top ten list of "table manners" - which apply to us at the Table of the Lord. See full description and comments at Fr. Toups' Blog. 6) Don't spoil your supper. 8) Speak when spoken to. 9) Never leave the table until you are excused. I have the great privilege of knowing Fr. Toups and many great priests the Diocese of St. Petersburg. Like Our Lord Jesus, these men lay down their lives for us, their sheep. Let us pray for all our priests today and support them in every way we can. It was during 7:45 a.m. Sunday Mass, and I was the only server on duty. Thirteen years old, I had been up since 5 a.m., when my dad and I set out to deliver Sunday papers on my Dayton Daily News route. Toward the end of the homily I began to nod off. “AHEM!” boomed Father Tom Meyer, right before the words “We believe in One God,” to start the creed, and I was jolted from my reverie. I got a similar holy “ahem” in 1998, when I was called to become director of altar servers at St. Raphael’s. Father Ken Malley, the parochial vicar at the time, was happy to have a volunteer handle organizing, training and scheduling our huge team of youth altar servers. Father Meyer, and other good priests of my youth, had planted seeds that turned into service. St. Raphael has one of the largest crews of youth altar servers in the Diocese of St. Petersburg. If you travel to other churches, as I often do, you’ll seldom if ever see as many servers in the sanctuary or as active in the Mass. At any given time there are nearly 100 servers signed up to serve on Sunday, representing nearly as many families. It must be the largest volunteer ministry in our parish. I’m not really sure how it got that way. Other big churches with schools and lots of families don’t always have active server programs. I’m sure it has something to do with the Holy Spirit and the high standards set by our church leaders. Monsignor Caverly, the first pastor I worked with, always valued the quantity and quality of our server crew. If kids feel more connected to the Mass, won’t vocations tend to follow? Won’t the parish be encouraged to see young men and women front and center in the Eucharistic celebration? I always thought he sent a strong, silent, subtle message (in typical Monsignor fashion). Father Sherwood has expressed the same support for an active server corps. Great parents have a lot to do with the success of our server program. Competing with sports, academic activities and travel plans is not easy. So many St. Raphael parents make serving a priority. I’ve had parents say they’ve skipped a soccer tournament on a Sunday morning to make sure a serving assignment was fulfilled. That would be heresy in secular circles. The program is not perfect. Kids make mistakes, act irreverently, act like kids, miss assignments. But I try to stress to adults who complain that kids will be kids, and parents are doing the best they can. These are the best and brightest children in our parish and we must be patient with them. In my 13 years, I’ve never had to “fire” a server for failure to do a good job. Patience is surely an important virtue when trying to mold the next generation of Catholics. Bob Musselman directs the altar server ministry at St. Raphael Catholic Church. My friend Bernadette Bailey says that her husband Mac used to say "Bernadette, you were born with a dish rag in your hand." She keeps a tidy house, that is for sure. My house is not so tidy, but the kitchen does get cleaned several times a day due to the constant eating of our growing children. Several years ago, as I was wiping down my counter, I decided to take this never-ending job and offer it up. I even decided to offer it up specifically for the conversion of a specific friend of mine. Over the years a lot of "Hail Mary's" have been said. And as they have been said, the job I dislike gets offered up. It is now a habit to pray as I wipe. So the time has been transformed for me. Kimberly Hahn shares a household prayer tip that I have also adopted. Her mother told her that as she does the wash or ironing, to pray specifically for the husband or child whose clothes she handles. Pray that this shirt clothes them for success during an important meeting or that these pants keep them warm as they do their school work. Me, I pray that the child who threw these stinky football socks, rolled up in a ball or inside-out, marries a very loving person that can put up with this! So what job do you dislike? How can you offer it up and for whom? I will keep you posted on my friend. No sign right now of her conversion...but I have great faith and lots of dirty counter tops! Just a few of the more than 3 dozen bagels God provided. ﻿ This week I forgot to pick up the bagels early in the morning as I usually do. So late afternoon, I called the bakery asked how long they were open and if they had any left. They were open for only 30 minutes more. I placed my order and said I will be there in 15 minutes. Upon arrival, I noticed the appliances were all wiped down and unplugged, the store was empty and the staff was watching the clock tick so their shift would end. I blurted out "hey are the bagels half price since it is the end of the day?" The clerk said "no" with a smile. I asked, what are you going to do with all these left over bagels as there were plenty in the rack. He told me, regretably, they would be thrown out. I then offered to take some off his hands and he started filling a bag. So for the price of a dozen, I took home three, plus two blueberry muffins that were also trash can bound. The bagels are cut and frozen and I thanked God for this little "budget stretcher" of my forgetfulness and the kindness of the baker. Now we need to work on a plan to get future unsold bagels to Pinelas Hope, our homeless shelter. "The emphatic claustrophobia and bold use of Italianate decorative motifs in this composition are characteristic of works produced by the first generation of Antwerp Mannerists, among whom Quentin Massys was one of the greatest practitioners. The scene is viewed up close, with half-length, gesticulating figures separated from the viewer by a fictive foreground ledge. The exotic neckpieces and clothing worn by the three Magi, and their vessels inlaid with precious stone and decorated with gold filigree are reminiscent of the finely wrought goldsmith work actually produced in Antwerp in the sixteenth century. 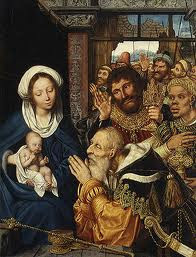 Massys's interest in dramatic expression and gesture is apparent in the highly expressive face of the oldest king in the foreground and the violent gestures and expressions of the crowd in the background; they are effectively juxtaposed with the pale, beautiful and sweet countenances of the Virgin and Child. Active for most of his career in Antwerp, Massys was among the first Netherlandish painters to employ the extreme physiognomic types popularized by Leonardo da Vinci (made available to Northern artists through prints), thus reacting against the tradition of using uniform facial features. It was this interest in the psychology of physiognomy that made Massys such a gifted portraitist." St. John Nepomucene Neumann C.Ss.R D.D. "John Neumann was born in what is now the Czech Republic in 1811. After studying in Prague, he came to New York at 25 and was ordained a priest. He did missionary work in New York until he was 29, when he joined the Redemptorists and became its first member to profess vows in the United States. He continued missionary work in Maryland, Virginia and Ohio, where he became popular with the Germans. January 5, 1860 the Bishop of Philadelphia lay crumpled in the snow a few blocks from his new cathedral on Logan Square. By the time a priest reached him with the holy oils, Bishop Neumann was dead. At his own request Bishop Neumann was buried in a basement crypt in Saint Peter's Church where he would be with his Redemptorist confreres. Well-known for his holiness and learning, spiritual writing and preaching, on October 13, 1963, he became the first American bishop to be beatified. Canonized in 1977." 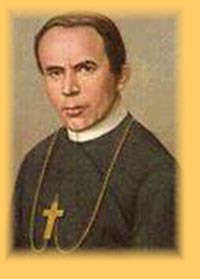 The spirituality of St. John Neumann is simple but powerful: Love Much, Work Hard, Pray Constantly. Let us commit ourselves to these three things today! Saint Elizabeth Ann Seton born in 1774, a native of New York was socialite, a wife, a mother, a convert to Catholicism and a foundress of a religious community of women. Seton is the first native-born American citizen to be canonized. She founded the Society for the Relief of Poor Widows With Small Children, New York City's first private charitable organization, and founded the U.S. Sisters of Charity. Seton was responsible for the parochial school system in the USA. "The accidents of life separate us from our dearest friends, but let us not despair. God is like a looking glass in which souls see each other. The more we are united to Him by love, the nearer we are to those who belong to Him." 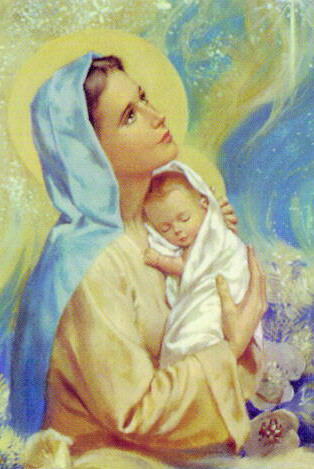 January 1, the Church commemorates the divine motherhood of the Blessed Virgin Mary, Mother of Jesus, Mother of God. The Feast falls within the octave or eight days of Christmas. Can we really understand the fact that God decided to become Man through a woman? That the creator of all things became human, like a creature? And to do so through Mary, a young maiden, who gave her yes to the mighty plans of God? When Mary gave her “fiat”, her “yes”, she was launched into a whole new life. How we can imitate Mary and continue to give a yes to God, day in and day out. He has great and wonderful plans for us. We can take them or leave them. But when we do give our yes, with full love and devotion, amazing things happen. We can be launched into a whole new life. I love that on the first day of a new year, the Church gives us this feast, with Mary as our model, for a fresh start. This enables us to dedicate the entire year to Jesus through Mary. We can start anew. Fr. Tim Sherwood pointed out in his homily for the Solemnity, that Mary witnessed glorious things at the birth of Jesus. She saw kings bow down to Him and present Him with gifts. But then she returned into the ordinary. She set out to raise up her son, like millions of other mothers before and after her. Let us, who have witnessed the glories of Christmas, go back into our ordinary lives and raise up Jesus, proclaim him and make Him known to all.